I’ve been trying out plinths for the automata. I made up a couple of drafts from corrugated card just to see if the size felt right. I’ve settled on 900mm for the height for the moment though I still have to check this with Dawn. Next step, see what it looks like made from more solid materials. I’ve been to the friendly local wood merchant who cut me various pieces to size. There will be a pine frame inside but just to see what it looks like I’ve propped up these pieces and stuck them together with masking tape. 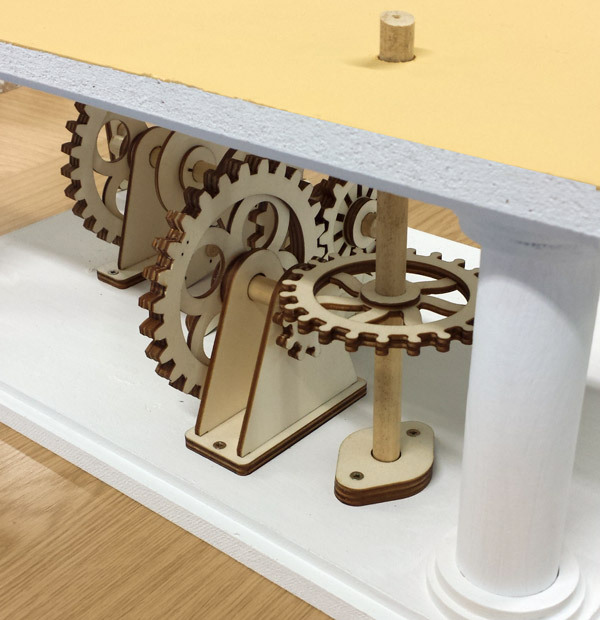 I’ve stood the mechanism from the Catherine Marshall model on the top to get an ides of how it all goes together. The characters themselves will sit on the top of the box and the whole of the automata will be protected inside a glass cover. I’ve added skirting board round the base for the plinth which I think finishes it off nicely. We are planning to use tokens rather than just a push switch to start the automata, the thinking being that the tokens will encourage people to place a value on each ‘performance’ encouraging them to stand and watch rather than rushing off to press the next button. I’ve sourced some coin slot mechanisms and programmed them to recognise tokens. One of these will fit into the front of the plinth. The instructions for the coin mechanism appear to have been translated from their original language using Google Translate but after a bit of frustration I have got the machine to recognise or reject coins as appropriate. For your interest here’s a closer look at the front half of the Catherine Marshall mechanism. In the initial planing we talked about how the automata in the Archive Project would be driven. We decided against manually turning a crank handle because we were worried about damage caused by over-vigourous cranking, clock work was out for practical reasons leaving electric motors. Some of the twenty models proposed need to be sited away from mains electrics so we plan to use 12v rechargeable batteries as the power source. I’ve sourced a suitable motor that is both powerful and runs quietly. The output shaft is 6mm in diameter and it runs at 145rpm, roughly two and a half turns a second. Pretty innit!? Now it needs a suitable mount. Here’s the cradle I’ve come up with, made from 3mm thick laser cut plywood. Notice the segmented segment in the cradle section. The gear box section of the motor sits here, the segments are glued into place and provide a surface to which the motor can be clamped. The motor fits in the cradle and a gear connects to the output shaft. The whole thing is clamped together with a jubilee clip allowing the motor to be removed and replaced in necessary. 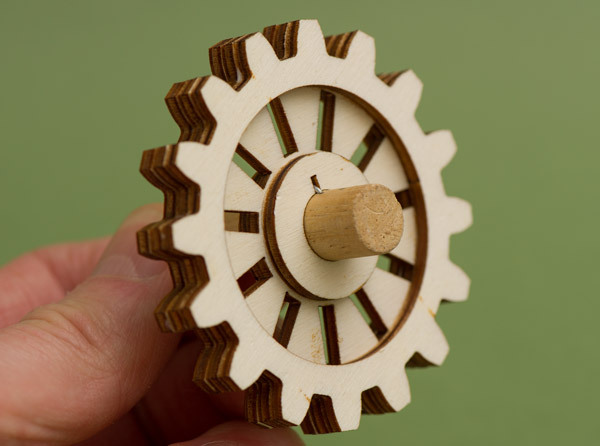 While I’m prototyping the gears on the wooden automata I need to be able to assemble and disassemble the model so that I can experiment with designs. I’ve tried all sorts of design variations. Brass axles, grub screws, flanges, perspex joints. Finally I feel like I have settled on a consistent design. I’m using 12mm dowel for the axles and a keyway in the gear’s axle hole to hold the gears in position. I drill a couple of small holes in the dowel in the place where the gear is being fitted. The holes don’t go all the way through the axle. I then make a curve-topped staple from a short length of 1mm diameter wire. The staple fits into the two holes, the fact that it is curve-topped ensures that the centre of the staple is raised above the dowel. 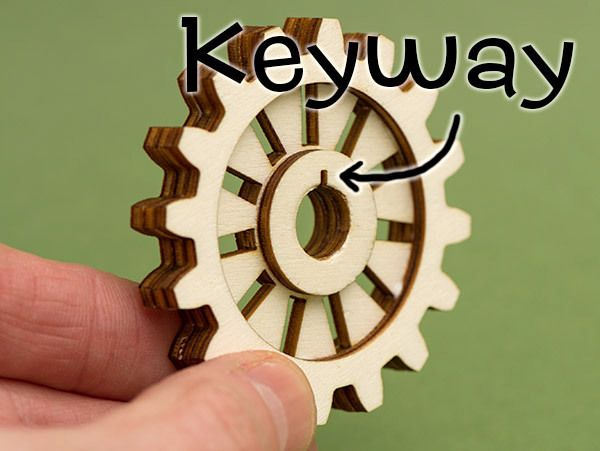 The gear then slips onto the shaft with the keyway located over the staple. The staple works to stop the gear rotating out of position. Perfect! Here’s a sample of the gears in position. Looking good!